DEGREE: M.S. in Conservation Medicine (MCM), addressing global environmental issues through a One Health approach. After graduating from veterinary school in Bogota, Colombia, I worked as a staff veterinarian in a wildlife rehabilitation center, where I had the opportunity to help endangered-species conservation programs in my country. 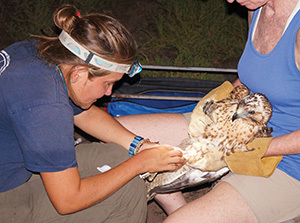 When I was finishing a clinical internship in raptor medicine and surgery at the University of Minnesota, I developed a huge interest in conservation medicine while helping with research projects. How are you using what you learned? Veterinarians in general tend to focus on the immediate impact we can have on an individual animal’s health. However, if we want to have a greater impact and protect entire populations, we need to tackle the issues at the larger scale, where interdisciplinary collaboration between researchers, field biologists, veterinarians, physicians, land managers, public health officials, educators and others is essential. I’m bringing my unique set of skills as a wildlife veterinarian with a background in conservation medicine to prevent extinctions and ecologically restore the Galapagos ecosystems. DEGREE: M.S. in Animals and Public Policy (MAPP), advancing the study of human-animal relations to elevate public dialogue and decision making. The MAPP program came at a time when I needed to learn the professional options available to those who care about animal welfare. 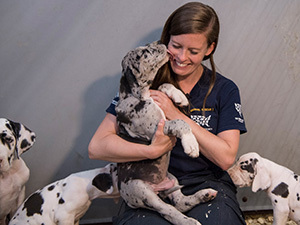 It provides a space and opportunity to learn the dozens of careers available to help animals. Gaining an understanding of public policy and its impacts on animals was career-changing. I am a registered lobbyist with the state and work to build coalitions to support legislative initiatives, such as strengthening our animal-cruelty statute, improving wildlife policy for bears, and protecting farm animals from confinement practices. My understanding of a range of issues has helped prepare me for the real world of political debate among private interest groups. The MAPP program’s overview of qualitative and quantitative studies allows me to review data and arguments from the opposition with a critical eye—and to form relevant, science-based arguments. DEGREE: M.S. in Infectious Disease and Global Health (MIDGH), training professionals to fight antimicrobial resistance, bioterrorism, and other health threats. I was interested in the MIDGH program at Tufts because it was an opportunity to challenge my own critical-thinking and scientific-inquiry abilities at a much higher level than I had previously been exposed to. 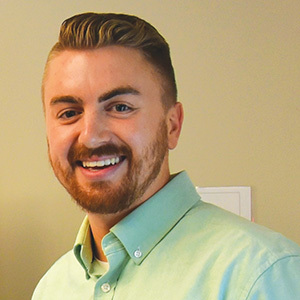 Not only was it a way for me to immerse myself in a much more advanced learning setting, but it was also a way for me to gain a competitive advantage when applying to professional research positions and medical schools. The team I am a part of at the MGH Cancer Center uses patient tumor samples to grow patient-derived tumor spheroids under conditions that mimic the tumor microenvironment within the patient’s body. We are using this platform to investigate the effects of novel immunotherapy drug combinations on the tumor and its microenvironment. The background knowledge I learned from each and every course taught in the MIDGH program has made me able to excel in the lab setting here at MGH.